After swimming or taking a shower or bath, do you suffer from water getting into your ears? Does this cause the discomfort and a tickling sensation in your ear? 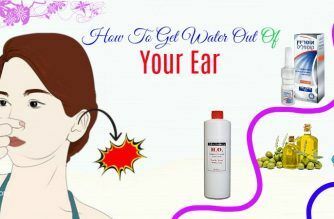 If “yes”, take your time and have a look at the article on Effective Remedies to discover 17 best ways on how to get water out of your ear naturally at home. In fact, water in the ear may be a common occurrence and happen to anyone. Generally, the wax in the ear canal can prevent water from going deep inside your ear. But sometimes, water can get trapped in your ear. It is often accompanied by pain and it can reduce your hearing ability. If left untreated, water in your ear may cause hearing loss, eardrum inflammation, cyst formation, and other complications. Therefore, it is important to get fluid out of your ear as soon as possible. To get rid of water in your ear, the first thing you need to do is to find out whether the water is trapped in your middle ear or outer ear. If fluid is accumulated in the middle ear, you must get the help of a doctor. For the fluid accumulation in your outer ear, you can treat it at home. Here are some simple but effective ways to try applying. Heat therapy can be listed in the effective ways on how to get water out of your ear quickly. Sometimes water can be trapped in the Eustachian tubes (which connect the middle ear to the part behind the nasal passages). The heat compress helps to open the Eustachian tube to release the water easily. Remember to use hot but not very hot water and wet a washcloth. Dip the washcloth in water and remove the excess water before using it. Now, tilt the head down on your affected ear and apply the washcloth to the outside of the ear. Leave it on the ear for 30 seconds and then take it out for a minute. You should repeat these steps 4 or 5 times. One of the best ways on how to get water out of your ear is gravity (title your head to one side). 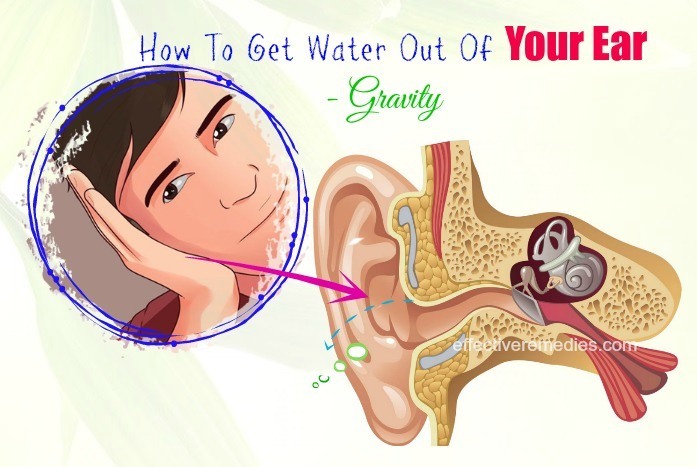 By this way, gravity helps to drain the fluid out of your ear easily because it finds the hole which it came in through. It is better for you to do gravity solution right after you finish swimming or taking a shower or bath. After that, remove the hand fast. The water will be dislodged by a vacuum that has recently formed. Note: Avoid inserting the ear bud in your ear. In fact, alcohol may help to evaporate the water in the ear effectively. In addition, it helps to dry up the fluid in your ear. Besides, the antibacterial properties present in the vinegar help to remove the growth of harmful bacteria, which may help to prevent an infection. If the trapped fluid occurs due to the buildup of earwax, the vinegar can help to remove it. At first, combine alcohol and vinegar at the ratio of 1:1 to make eardrops. Now, use a sterile dropper to apply 3 or 4 drops of the mixture into your ear. After that, rub gently the outside of the ear and then wait 30 seconds. Finally, tilt the head sideways to drain out the solution. Note: Avoid using this method if you suffer from a perforated eardrum, an outer ear infection, and tympanostomy tubes (eardrum tubes). If you are looking for the ways on how to get water out of your ear, you should not skip a blow dryer. The heat from the blow dryer can aid in evaporating the water in your ear canal. The warm & dry air then turns the fluid to steam and lastly help it drain out of your ear. Be careful to avoid burning your ear and the side of the face. In case, it causes pain or you feel too hot, stop doing this method immediately. Firstly, pull the earlobe away from the body. Then, hold a dryer about 10-12 inches away from the ear. Remember to set the blow dryer heat to warm & air flow to low. Next, turn the blow dryer on and then aim it directly into your ear canal. After that, hold the blow dryer in this position for about 30 seconds. If needed, repeat it again. Now: Avoid doing this process for more than 3-4 minutes at one time. Hydrogen peroxide is considered as another effective way on how to get water out of your ear. Thanks to its effervescent effect, hydrogen peroxide may easily drain out the trapped water, along with earwax, debris, and bacteria from your ear canal . Firstly, use a clean dropper to add 3 to 4 drops of hydrogen peroxide to your ear. Now, wait for 2 to 3 minutes. After that, tilt your affected ear downward to drain the water out of the ear. The list of the effective ways on how to get water out of your ear is incomplete without including salt. Salt may help to absorb water easily; thus, you may use this ingredient to drain water out of your ear. In addition, you can get relief from the pain caused due to this issue and make the water evaporate by the heat from this hot salt compress. At first, heat 1/4 cup of salt in a microwave. Next, put the salt in one cotton cloth and then tie it tightly. After that, hold this cloth against the opening of your affected ear for 2 to 3 minutes. Repeat this method as needed. If you want to discover more, stay with us and keep reading in the next part of this article.